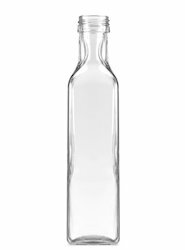 We are offering a wide range of 500 ml Olive Oil Empty Glass Bottle to our clients. Daga plastics offer their clients a range of properly fabricated Kitchen Edible Oil Container. These cylindrical containers with green caps are hygienically manufactured. Our products pass through stringent tests to meet all the standards of quality. We manufacture these products with extreme care. The handles attached to the neck of these containers make them easy to handle. This Is Suitable To Pack The Contents Without Internal Pressure Such As CO2 Gas. Now, It Is Applied To , Mineral Water, Detergent, Medicine, And So Forth As Foodstuffs Like Vinegar, Edible Oil, and Soy Sauce. Hardness: As per the customer's requirement. With the valuable assistance of skilled team of professionals, we are engaged in offering an extensive array of Coconut Oil Bottles. The offered array is manufactured with the help of quality raw materials and modern techniques. These bottles are designed for storing coconut oil. These bottles are attached with fixed seal cap. Sarthak Pet Industries (india) Pvt. Ltd.
We are offering 200 ml Almond Oil Bottle with 20 mm Screw Cap and Plug Code-134 to our clients.